I practice a holistic approach to health and wellness, which means that I look at how all areas of your life are connected. The “Whole” picture. Does stress at your job or in your relationship cause you to overeat or chose the wrong foods? Does lack of sleep or low energy prevent you from exercising? As we work together, we will look at how all parts of your life affect your health as a whole. I also don’t like restrictive lists of bad foods, I find them pretty useless, although I will gladly inform you on why certain foods are amazingly beneficial and others are terrible. Really my intention and purpose is to work with you to create a happy, healthy life in a way that is sustainable, realistic, flexible, fun and rewarding. Some goals we can work together on may include achieving optimal weight, reducing stress, reducing food cravings, increasing sleep, and maximizing energy. As we work together, you’ll develop a deeper understanding of the food and lifestyle choices that work best for you and implement lasting, sustainable changes that will improve your energy, balance and health. Bio-individuality™: What works for your friends might not work for you. The concept of bio-individuality is that each person has unique food and lifestyle needs. One person’s food is another person’s poison, and that’s why fad diets tend to fail in the long run. Working on the principle of bio-individuality, I’ll support you to make positive changes that are based on your unique needs, lifestyle, preferences, and ancestral background. I use a personalized, holistic approach to ensure that you will have great success! Primary Food™: It’s easy to overlook all of the things that contribute to our sense of nourishment and fulfillment. It’s not just the food we eat, but all of the other factors present in our daily lives. Creativity, Healthy relationships, a fulfilling career, regular physical activity and a spiritual awareness are essential forms of nourishment. When these “primary foods” are balanced, what you eat becomes secondary. I will support you in achieving all of your goals, from eating the right foods for you specifically to living an inspired, creative and fulfilling life. 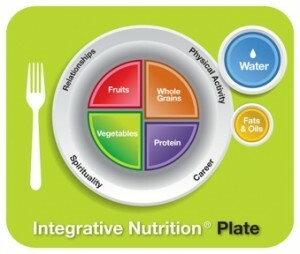 Integrative Nutrition™ Plate: This plate is a little different for everyone. It emphasizes the importance of local and organic produce, whole grains, high-quality proteins, plant-based fats, and water. It shows you how a plate should appear at mealtime and emphasizes the importance of proportions and portion size. To complete the picture, the plate is surrounded with lifestyle factors that create optimal health: relationship, career, physical activity and a spiritual practice (this could mean just getting out in Nature!) I’ll introduce you to some of the healthiest foods on the planet and teach you how to find what’s healthiest specifically for you! So, Are you ready to start feeling better than ever? Schedule an initial consultation with me today. Looking forward to hearing from you!